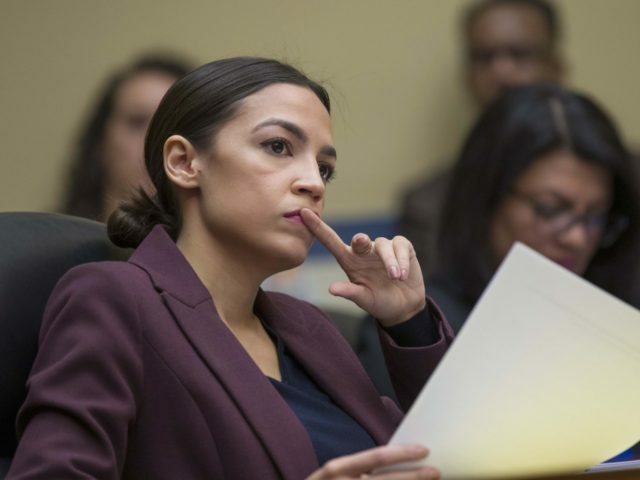 Ocasio-Cortez was responding to tweets by fellow Democrat Rep. Juan Vargas (D-CA), who criticized Rep. Ilhan Omar (D-MN) for her repeated use of antisemitic rhetoric. Vargas is staunchly pro-Israel, and was one of the few Democrats who dared oppose President Barack Obama’s nuclear deal with Iran in 2015, as Breitbart News reported at the time. She then went on to cite the Iraq War, and claimed, erroneously, that Rep. Barbara Lee (D-CA) was the only member of Congress to support it. In fact, Lee cast the lone vote against the AUMF on Sep. 14, 2001, following the attacks on the World Trade Center in New York and the Pentagon in Washington, which killed nearly 3,000 Americans. In her speech explaining her vote, Lee warned that the U.S. risked becoming like the terrorists: “Let us not become the evil that we deplore,” she said. The AUMF provided the basis for the war in Afghanistan. After 17 and-a-half years, many members of Congress — on both sides — have begun to question, the efficacy of that war and the relevance of the AUMF. However, in the immediate aftermath of 9/11, the country was unified on the need to take action against the terrorists who had murdered thousands of Americans as part of a holy war to destroy the country and, indeed, western civilization. In the 2008 presidential election, then-Sen. Barack Obama (D-IL), who said he would have voted against the Iraq War had he been in Congress, portrayed the war in Afghanistan as the “good” war, and vowed to hunt down Al Qaeda leader Osama bin Laden. In 2011, President Obama announced to the nation that Osama bin Laden had been found and killed. Rep. Alexandria Ocasio-Cortez, Democrat of New York, would have opposed that effort.